Two years ago there was only one iMac, a powerful bondi blue beauty. Now the iMac has grown into a family, and a large one at that. The change from five fruity colors to more professionally named indigo, ruby, and sage, is the most noticeable evolution. The addition of snow along with a refined graphite for the Special Edition model give the high end a choice of color - in case graphite doesn't match the curtains. The alterations set the iMac at speeds from 350 MHz to 500 MHz, along with much larger hard drives. With four models to choose from, there's got to be one that fits you. In the spirit of the original model, Apple kept one of the iMacs simple and cheap. This model, only available in indigo, has a price set at an all-time low of US$799, down from $999. This is sure to make it more appealing to sub-$1000 computer shoppers and help it compete better with Dell's cheap PCs. With a 350 MHz processor speed, the only Mac slower is the iBook, which could pick up speed soon. The 64 MB of RAM is now the standard, but it would be safe to add at least 32 MB more if you hope to install OS X. The hard disk is 7.5 GB, enough for an average user. This iMac is what the original was, cheap and easy. No extra options or features to get in the way. Just a good computer. Perfect for those who want a good word processor, internet browser, and a decent game machine. The naming gets me here. Do not relate this model to the old iMac DV. It seems that this model should be called iMac DV Minus, because the drive was downgraded from DVD-ROM to CD-ROM, which takes a lot out of the DV. This is basically the base-level iMac with FireWire ports, a 400 MHz processor, and a slightly larger hard drive. Apple introduced this iMac DV to extend the Desktop Movie production to more people at a price of $999. 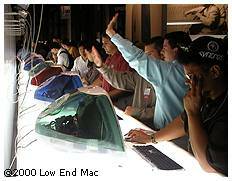 However, a quick look through any Circuit City or Best Buy newspaper advertisement shows that the digital video cameras cost almost as much as the iMac DV! If someone has $1000 to blow on a video camera, they will probably invest an extra $300 to get the DV Plus, which leaves this indigo and ruby cutie in questionable fate. For only $300 more than the iMac DV, the iMac DV+ adds a lot. With a 450 MHz G3 at the core and a 20 GB hard drive, a whole lot more digital video editing can be going on with this iMac. Perhaps the biggest improvement is the DVD-ROM drive. Although no or almost no software has been widely distributed on DVD, it will happen someday, and the iMac DV+ will be ready for it. Of course, you can't ignore DVD movies, which have become more and more popular since the late 1990s. The iMac DV+ will be loved by college dorm students who can't fit much more than a few hockey puck mice in their cramped dwelling, much less a TV and DVD player. By-the-way, if you haven't seen the commercial for the Sage iMac DV+, check it out at Apple's website; there's a voice you might recognize. This one is for those who have enough money to buy and could use the power of a G4, but just love the look of an iMac on their desk. Of course, some might also opt for it to match their iBook Special Edition, but that's a long shot. The iMac DV SE is the most powerful iMac to date. The blazing fast 500 MHz G3 probably sets it on par with the base level G4 and Cube on non-optimized apps, and the included 128 MB of RAM give plenty of elbow room for almost all of your apps, even OS X when it comes along. 30 GB of storage will last you a good while, but check next year and we probably won't be saying that about 50 GB. Even though Apple invented the iMac to add color to our lives, they have made an iMac without any, and I'm not complaining. I would choose the Snow iMac as the Ms. USA of the computer world. If beauty means everything to you, and you are okay with a lot of computing power, this iMac is perfect for you. The iMac has branched into a family tree. I wouldn't be surprised if an iMac+ was born, or a totally renamed iMac 2 family was begotten. One thing is certain, the iMac isn't a simple choice anymore. A buyer used to be able to say, "I want an iMac" and get one. Now they get the response, "Do you want an iMac, an iMac DV, an iMac DV+, or an iMac DV Special Edition. Oh, and the iMac comes in indigo, the iMac DV comes in indigo and ruby, the iMac DV+ comes in indigo, ruby, and sage, and the iMac DV Special Edition comes in graphite and snow." There's no doubt the iMac is improving, but with every upgrade it becomes more un-iMac. I'm in no way criticizing Apple, because there's nothing Apple can do about it. You can't add options without losing simplicity, and I'd take more options any day. Personally, I can't wait to see a happy Mac-loving couple put mini graphite and snow iMacs on top of their wedding cake.